Heroku is a cloud platform as a service (PaaS) supporting several programming languages. Heroku, one of the first cloud platforms, has been in development since June 2007, when it supported only the Ruby programming language, but now supports Java, Node.js, Scala, Clojure, Python, PHP, and Go. For this reason, Heroku is said to be a polyglot platform as it has features for a developer to build, run and scale applications in a similar manner across most languages. Heroku was acquired by Salesforce.com in 2010 for $212 million. Heroku was initially developed by James Lindenbaum, Adam Wiggins, and Orion Henry for supporting projects that were compatible with the Ruby programming platform known as Rack. The prototype development took around six months. Later on, Heroku faced drawbacks because of lack of proper market customers as many app developers used their own tools and environment. In Jan 2009 a new platform was launched which was built almost from scratch after a three-month effort. In October 2009, Byron Sebastian joined Heroku as CEO. On December 8, 2010, Salesforce.com acquired Heroku as a wholly owned subsidiary of Salesforce.com. On July 12, 2011, Yukihiro "Matz" Matsumoto, the chief designer of the Ruby programming language, joined the company as Chief Architect, Ruby. That same month, Heroku added support for Node.js and Clojure. On September 15, 2011, Heroku and Facebook introduced Heroku for Facebook. At present Heroku supports Redis databases in addition to its standard PostgreSQL. The name "Heroku" is a portmanteau of "heroic" and "haiku". The Japanese theme is a nod to Matz for creating Ruby. The name itself is pronounced similarly to “widening” in Japanese, though the creators of Heroku did not want the name of their project to have a particular meaning, in Japanese or any other language, and so chose to invent a name. Applications that are run on Heroku typically have a unique domain (typically "applicationname.herokuapp.com") used to route HTTP requests to the correct dyno. Each of the application containers, or dynos, are spread across a "dyno grid" which consists of several servers. Heroku's Git server handles application repository pushes from permitted users. All Heroku services are hosted on Amazon's EC2 cloud-computing platform. The main content of the development are the source code, related dependencies if they exist, and a Procfile for the command. The application is sent to Heroku using either of the following: Git, GitHub, Dropbox, or via an API. There are packets which take the application along with all the dependencies, and the language runtime, and produce slugs. These are known as build-packs and are the means for the slug compilation process. A slug is a combination/bundle of the source code, built dependencies, the runtime, and compiled/generated output of the build system which is ready for execution. Next is the Config vars which contain the customizable configuration data that can be changed independently of the source code. A release is a combination of a slug (the application), config vars and add-ons. Heroku maintains a log known as the append-only ledger of releases the developer makes. 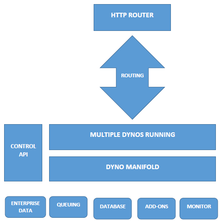 The main unit which provides the run environment are the Dynos which are isolated, virtualized unix containers. The application's dyno formation is the total number of currently-executing dynos, divided between the various process types the developer has scaled. One-off Dynos are temporary dynos that run with their input/output attached to the local terminal. They're loaded with the latest release. Each dyno gets its own ephemeral filesystem with a fresh copy of the most recent release. It can be used as temporary scratchpad, but changes to the filesystem are not reflected to other dynos. Logplex automatically collates log entries from all the running dynos of the app, as well as other components such as the routers, providing a single source of activity. The definition of the application i.e. the source code and the description is built on the framework provided by Heroku which converts it into an application. The dependency mechanisms vary across languages: for Ruby the developer uses a Gemfile, in Python a requirements.txt, in Node.js a package.json, in Java a pom.xml, and so on. Developers don't need to make many changes to an application in order to run it on Heroku. One requirement is informing the platform as to which parts of the application are runnable. This is done in a Procfile, a text file that accompanies the source code. Each line of the Procfile declares a process type — a named command that can be executed against the built application. Application development on Heroku is primarily done through git. The application gets a new git remote typically named as Heroku along with its local git repository where the application was made. Hence to deploy heroku application is similar to using the git push command. There are many other ways of deploying applications too. For example, developers can enable GitHub integration so that each new pull request is associated with its own new application, which enables all sorts of continuous integration scenarios. Dropbox Sync lets developers deploy the contents of Dropbox folders to Heroku, or the Heroku API can be used to build and release apps. Deployment then, is about moving the application from a local system to Heroku. The mechanism for the build is usually different for different languages, but follows the consistent pattern of retrieving the specified dependencies, and creating any necessary assets (whether as simple as processing style sheets or as complex as compiling code). The source code for the application, together with the fetched dependencies and output of the build phase such as generated assets or compiled code, as well as the language and framework, are assembled into a slug. Applications in Heroku are run using a command specified in the Procfile, on a dyno that's been preloaded with a prepared slug (in fact, with the release, which extends the slug, configuration variables and add-ons). It's like running dyno as a lightweight, secure, virtualized Unix container that contains the application slug in its file system. Heroku will boot a dyno, load it with the slug, and execute the command associated with the web process type in the Procfile. Deploying a new version of an application kills all the currently running dynos and starts new ones (with the new release) to replace them, preserving the existing dyno formation. A customization of the existing configuration is possible as the configuration is done not within the code but in a different place outside the source code. This configuration is independent of the code currently being run. The configuration for an application is stored in config vars. At runtime, all of the config vars are exposed as environment variables so they can be easily extracted programatically. A Ruby application deployed with the above config var can access it by calling ENV["ENCRYPTION_KEY"]. All dynos in an application will have access to exactly the same set of config vars at run-time. The combination of slug and configuration is called a release. Every time a new version of an application is deployed, a new slug is created and release is generated. As Heroku contains a store of the previous releases of the application, it's designed to make it easier to roll back and deploy a previous release. A release, then, is the mechanism behind how Heroku lets the developer modify the configuration of the application (the config vars) independently of the application source (stored in the slug) — the release binds them together. Whenever the developer changes a set of config vars associated with the application, a new release will be generated. Dyno manager help maintain and operate the dynos created. Because Heroku manages and runs applications, there's no need to manage operating systems or other internal system configuration. One-off dynos can be run with their input/output attached to the local terminal. These can also be used to carry out admin tasks that modify the state of shared resources, for example database configuration, perhaps periodically through a scheduler. Dynos do not share file state, and so add-ons that provide some kind of storage are typically used as a means of communication between dynos in an application. For example, Redis or Postgres could be used as the backing mechanism in a queue; then dynos of the web process type can push job requests onto the queue, and dynos of the queue process type can pull jobs requests from the queue. Add-ons are associated with an application, much like config vars, and so the earlier definition of a release needs to be refined. A release of the applications is not just the slug and config vars; it's the slug, config vars as well as the set of provisioned add-ons. Heroku treats logs as streams of time-stamped events, and collates the stream of logs produced from all of the processes running in all dynos, and the Heroku platform components, into the Logplex- a high-performance, real-time system for log delivery. Logplex keeps a limited buffer of log entries solely for performance reasons. Heroku's HTTP routers distribute incoming requests for the application across the running web dynos. A random selection algorithm is used for HTTP/HTTPS request load balancing across web dynos. It also supports multiple simultaneous connections, as well as timeout handling. The Heroku network runs the customer's apps in virtual containers which execute on a reliable runtime environment, heroku calls these containers Dynos. These Dynos can run code written in Node, Ruby, PHP, Go, Scala, Python, Java, Clojure. Heroku also provides custom buildpacks with which the developer can deploy apps in any other language. Heroku lets the developer scale the app instantly just by either increasing the number of dyno or by changing the type of dyno the app runs in. Heroku Teams is a team management tool which provides collaboration and controls to bring customer's developers, processes and tools together in order to build better software. With Heroku Teams, teams can self-organize, add and manage members, get fine grained control with app-level permissions and also use collaboration tools like Heroku Pipelines. It also provides delegated administration and centralized billing. Heroku Enterprise provides services to large companies which help them to improve collaboration among different teams. It provides a set of features like fine grained access controls, identity federation and private spaces, to manage their enterprise application development process, resources and users. Heroku Elements provides users with Add-ons -Tools and services for developing, extending, and operating the app , Buildpacks-Buildpacks automate the build processes for the preferred languages and frameworks and Buttons -one-click provision, configure and deploy third party components, libraries and pattern app. ^ "Heroku". Crunchbase. Retrieved March 2, 2016. ^ "About Heroku". Stack Overflow. Retrieved March 2, 2016. ^ "James Lindenbaum - Founder @ Heavybit - crunchbase". Retrieved 22 October 2016. ^ "Adam Wiggins". Retrieved 22 October 2016. ^ "Six Things to Consider When Using Redis on Heroku". Redis Labs. Retrieved March 2, 2016. ^ "Rails Heroku Tutorial". RailsApps Project. Retrieved March 2, 2016. ^ "The term is merger of "Hero" and "Haiku". | Hacker News". news.ycombinator.com. Retrieved 2016-08-05. ^ "Douglas Drumond's answer to What does Heroku mean? - Quora". qr.ae. Retrieved 2016-08-05. ^ "What is application containerization (app containerization)? - Definition from WhatIs.com". Retrieved 22 October 2016. ^ "Dynos and the Dyno Manager - Heroku Dev Center". Retrieved 22 October 2016. ^ "Scalability: How does Heroku work? - Quora". Retrieved 22 October 2016. ^ "Deploying Node.js Apps on Heroku - Heroku Dev Center". Retrieved 22 October 2016. ^ "Heroku Security". Retrieved 1 December 2017. ^ a b Heroku Cloud Application Development. Packt Publishing Ltd. 2014. ^ "Process Types and the Procfile - Heroku Dev Center". Retrieved 22 October 2016. This page was last edited on 13 April 2019, at 06:40 (UTC).